Here’s an interesting fact for you: according to their website, Mr Chips is the first traditional fish and chip shop in the centre of Reading for 20 years. I think they’re right, too – before that there was Harry Ramsden’s, now a sad derelict space under the Travelodge at the top of the Oxford Road – but I can’t think of anywhere else. Come to think of it, you don’t see many fish and chip restaurants in general. Every pub will do fish and chips, many restaurants will too but a place devoted to fish and chips? No, when people want fish and chips they generally head to their favourite chippy (and we could have a heated debate about the merits of the Jolly Fryer, Seaspray and the 555 Fish Bar but, on second thoughts, let’s not) and then carry it home and have it on their laps in front of the telly. Just me? Even in London, eat in fish and chip restaurants are one of those trends that didn’t quite catch on: so is Mr Chips a trailblazer, or is it trying to service a market that doesn’t really exist? It’s definitely a chippy that has a few seats rather than a fish and chip restaurant. There is a bar in the window with a few uncomfortable seats that are part stool, part pogo stick, and a couple of tables along the side of the long thin room (at the back were some big sacks of potatoes – an encouraging sign, I thought). Apart from that? Well, you’re in a chippy. The usual glass fronted cabinet is there, full of battered sausages and Pukka Pies and the menu behind the counter offers the usual suspects – cod, haddock, mushy pea fritters, curry sauce – along with the occasional curveball. So you can also order “crab claws”, which from the picture on the wall appear to be nothing of the kind, and – if you’ve always wanted to try one without venturing north of the border – a deep fried Mars Bar. I tried haddock (because that’s what I generally have from the chippy) and skate wing (for what can only be described as the “George Mallory reason”). Sitting at one of the little tables, drinking my can of cream soda and waiting for my fish to be cooked I did feel a little silly, as clearly most of Mr Chips’ customers treat it as a conventional chippy – drop in, pick up their food and then go. I felt equally silly trying to hack through freshly fried batter with an inadequate plastic knife and fork – although it’s a compliment to the batter to say that when I tried to get a plastic knife through it I rather suspected that the knife would break first. Anyway, enough of these quibbles: what was it like? 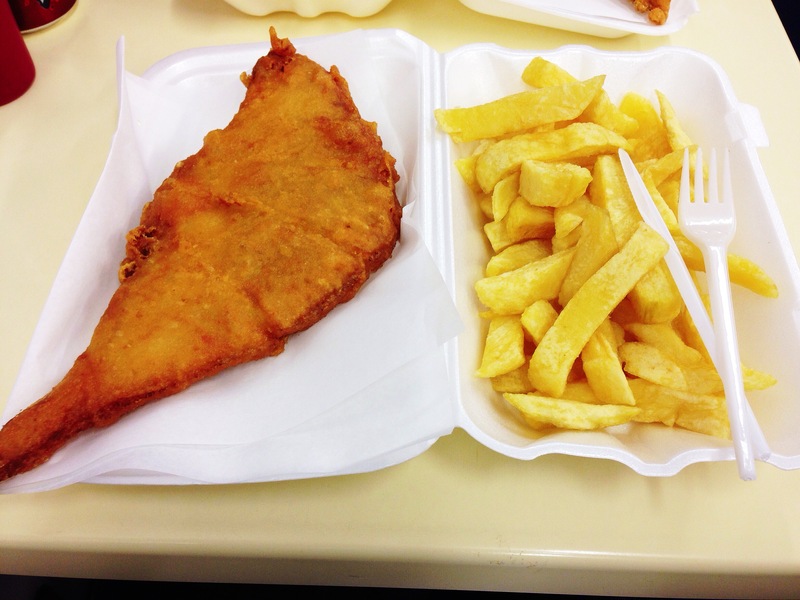 The skate was odd – I’ve never ordered it in a chip shop before and I can safely say I probably won’t again. A lot of that is about the fish, not the fryer: the challenge of getting the batter and the flesh away from the cartilage was a little too much like hard work, and not quite worth the effort. But it didn’t feel like brilliant quality skate, either – perhaps I’ve been spoiled by all those pristine white fillets in restaurants but this was a little brown and forlorn, with some of the skin left on. Having said all that, the batter was just gorgeous – light, crispy and salty it broke away in fragments like shards of edible glass. The skate was freshly cooked, possibly because it’s not something most people order, but I do wonder if the batter would have been as good if I’d chosen something that had been sitting in the cabinet. The haddock didn’t seem quite as crisp – I’m not sure whether it was cooked with the skate or taken out of the cabinet – but it was still respectable. The fish was flaky and perfectly cooked and the best bits of the batter had that bubbly crispness that reminds me of really good school dinners. On balance I liked it better than the skate, because when you’re eating comfort food there’s no point in leaving your comfort zone. The chips were pretty decent chip shop chips. A little wan for my liking, although that might be a matter of personal taste, and with no crispy little fragments at the bottom to resist the softening effect of vinegar and make for the perfect final sour-salty-crunchy mouthful, but clearly from good quality potatoes and rather tasty. I didn’t try the curry sauce or the sweet and sour sauce (I rather regret that now, but teaming them with the skate wing in particular felt plain wrong) but the tomato sauce on the table was too sharp and vinegary to be Heinz. I didn’t mind, but ketchup purists might. I also didn’t try the bubble tea – and I barely even know what it is, despite having Googled – but it would be remiss not to mention it as it’s a big part of what Mr Chips does (it even forms part of their website address, for goodness’ sake). So at the front are a wide range of, well, fruit flavoured balls you can lob into one of about twenty types of fruity or milky tea. Just writing all that makes me feel about three hundred: what’s wrong with just offering a red and a blue Slush Puppie, eh? Service was neither rude nor effusive, but that’s fine. It’s a chippy, not the latest entry in the Michelin Guide. It was better than the service in the Reading branch of Harry Ramsden over twenty years ago, if that counts for anything, but from memory I’m not sure it does. I don’t think that Mr Chips does enough to break that pattern that fish and chips is something you pick up and take home. In fairness to them, I’m not sure they’re trying to: it felt like a chippy that lets you eat in rather than an upmarket London joint like Kerbisher and Malt. It does decent, reasonably priced fish and chips, and if you were in town of an evening, in a hurry to eat something quick and you fancied fish and chips it would be the place to go. If I was, I would. But here’s the problem: how often is that really going to happen, do you think? Go to Sapana Home, someone recommended on Twitter recently. Great dumplings, good curry and brilliant value. Well, I thought, how can you argue with that? In a single Tweet they’d conveyed easily as much information as you find in one of my reviews, so the least I could do was act on the tip-off. It’s a low-key place at the end of Queen Victoria Street closest to the station, and the inside is unprepossessing and unpretentious. A long thin room, it has some little tables for two at the front and a couple which can seat four at the back near the counter (downstairs is bigger, but a bit like a cellar and not a room you’d want to eat in unless it was full and had some atmosphere). And Sapana wasn’t full when I got there around half-eight on a weekday night – although, unusually, it was almost full when I left. There’s no website so I wasn’t sure what to expect. I’m so used to checking out menus before I go to a restaurant to review it that it was a strange experience seeing it for the first time in the restaurant and being expected to know what I wanted to eat pretty much there and then. The pressure! (Yes, yes, I know: this is how it is for most people in most restaurants pretty much all of the time). That said, the menu at Sapana couldn’t be more helpful, as it not only describes the dishes but has lots of photos of the food. Yes, photographs. Normally, these conjure up the whiff of package holidays (and garishly saturated pictures of English breakasts. 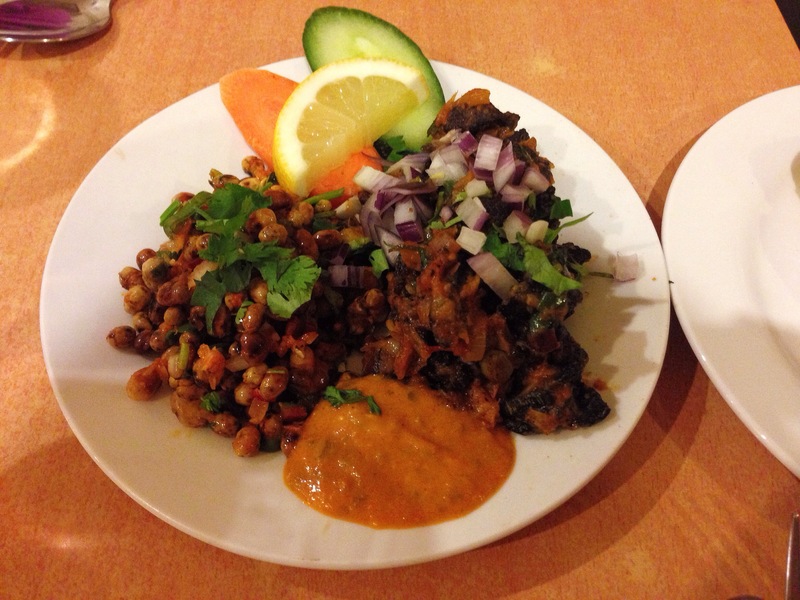 And flashbacks about holidays – and English breakfasts – I’d sooner forget) but in Sapana they were very useful because my experience of Nepalese food is limited and it was nice to know what you’re letting yourself in for. So what was I letting myself in for? 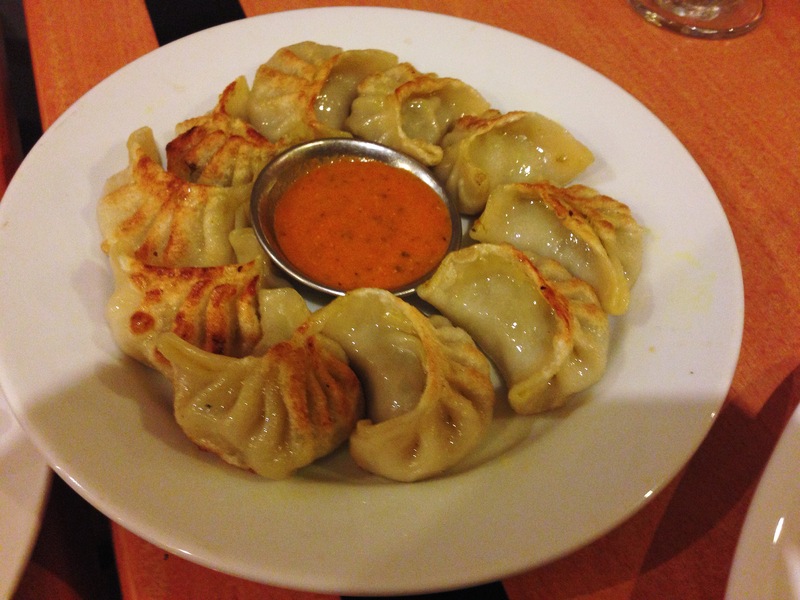 Well, momos for a start: all the reviews I’ve read mention them so it felt rude not to sample them. You get a choice of fillings and can either have them steamed (if you’re feeling virtuous), deep fried (if you’re not) or pan-fried (if you’re not but you want to kid yourself that you are). Mine were the latter, packed with chicken and every bit as good as everybody says – with hints of lemongrass and coconut, delicious with the spicy accompanying sauce. Generous, too: I think this helping was something like six pounds and easily divided between three without leaving anybody feeling short changed (their close relative, the gyoza, costs about the same over at Wagamama for half as many). Of course, that didn’t stop the three of us sampling two other starters. Of those, the best was definitely sukuti bhatamas – dried buffalo meat in herbs and spices with soy beans, onions, garlic and chilli. The meat was in little intense crispy nuggets, somewhere between the texture of biltong and really good pork scratchings, in a very, very hot sauce, topped with crisp raw red onion. The beans with it were a little disconcerting: I was expecting them to be soft but quite a few were crunchy, hard even, but once I got my head round that I enjoyed the whole lot. It was topped with fresh coriander and served with a helping of sauce which was either the same as the one which came with the momos or too close for me to be able to tell the difference. Halfway through this dish the waitress thoughtfully brought over three glasses of water, not a moment too soon (that kind of thoughtful, polite service was repeated all evening). 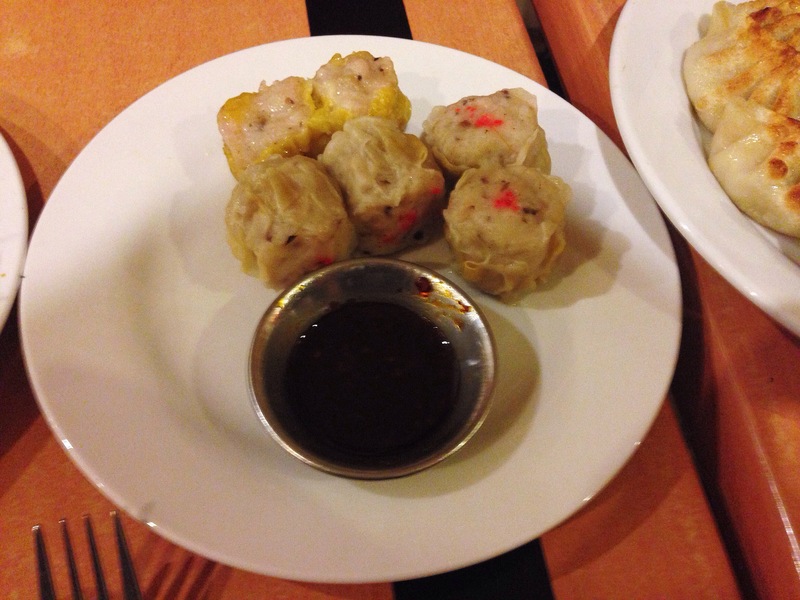 The siu mai – pork dumplings – were less impressive. I was expecting a fluffy steamed pork bun type affair but these were gelatinous pork cylinders wrapped in a thin layer of wrinkled pastry. There wasn’t any flavour to them, either, unless you dipped them in the fiery chilli sauce that they came with. Partly my mistake, I suspect: if I’d done my homework better I’d have understood that Nepalese food had elements of dim sum in it, but never mind. If the starters were a mixed bag, they were at least an interesting bunch – lots of fire and flavour, texture and contrasts. That’s what made the main courses baffling, because they were so bland by comparison. 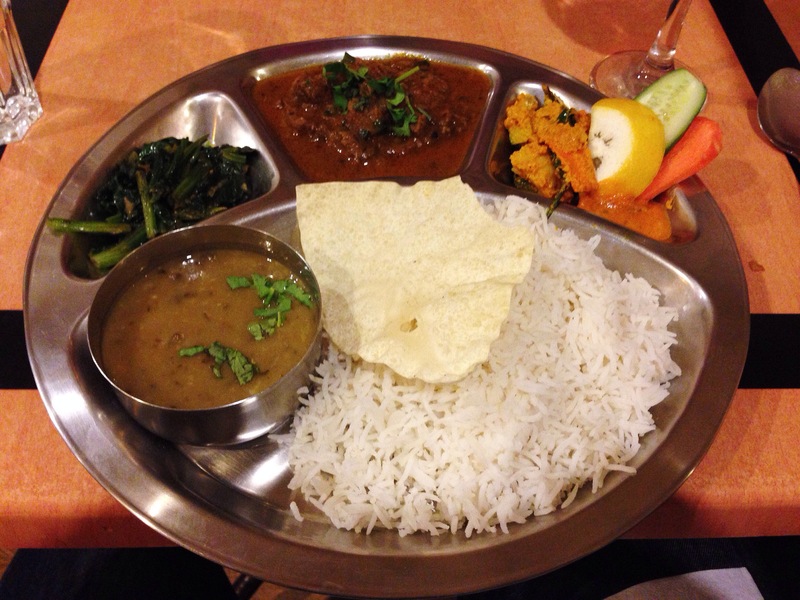 Two of us had thali, those metal compartmentalised plates that offer (in theory) the chance to try lots of different things. The reality was more the opportunity to experience a wide range of disappointments. Dhal was stodgy and bland with an odd undertone of something like evaporated milk. Spinach was floppy and strangely flavourless. The vegetable curry, served crunchy and cold in a nutty sauce, was the pick of the bunch but there was nowhere near enough of it to save the day. The meat curry – not an awful lot of it – was watery and not very interesting, with enough shards of bone in the chicken and enough gristle in the lamb that you didn’t feel you could risk eating a piece without a thorough inspection (a process which, I’ve always thought, rather gets in the way of a relaxing meal). You also got a lot of rice, more rice than you could humanly eat, with a limp shard of poppadom on top – although the variant with chapati roti, which also included rice, was a much better bet. This all cost eight pounds – not a huge amount in the scheme of things for a main course, but it still didn’t feel like good value. 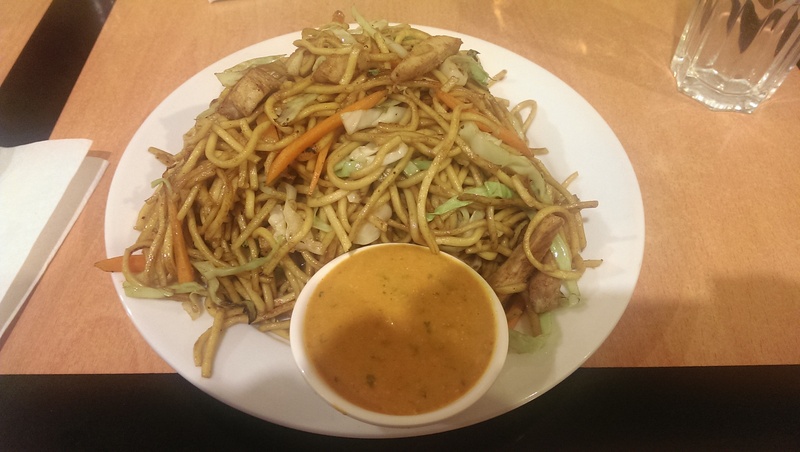 The other dish was chicken chow mein. A perfectly decent chow mein, freshly made with a decent amount of chicken, a few bits of shredded cabbage and carrot and noodles. Lots and lots of noodles. It didn’t seem to me to be any different to one I would get from a Chinese takeaway – no extra spice, no added flavour or exotic ingredients; just a plain chow mein. I’m not sure what I was expecting, but it wasn’t this: like the siu mai, I felt this was probably my mistake. I’m never sure it should be possibly to order badly in a good restaurant, but I did have an increasing feeling that maybe I hadn’t given the place the opportunity to do itself justice. That’s the main reason we ordered dessert, even though we weren’t hungry any more, but it didn’t really improve matters. The gulab jamun were a shadow of other versions I’ve had elsewhere in town. Instead of being squidgy, doughy balls, soaked in glorious sweetness, these were hard and very cold with minimal syrup. It was like they’d taken the dish I love and extracted all the fun. 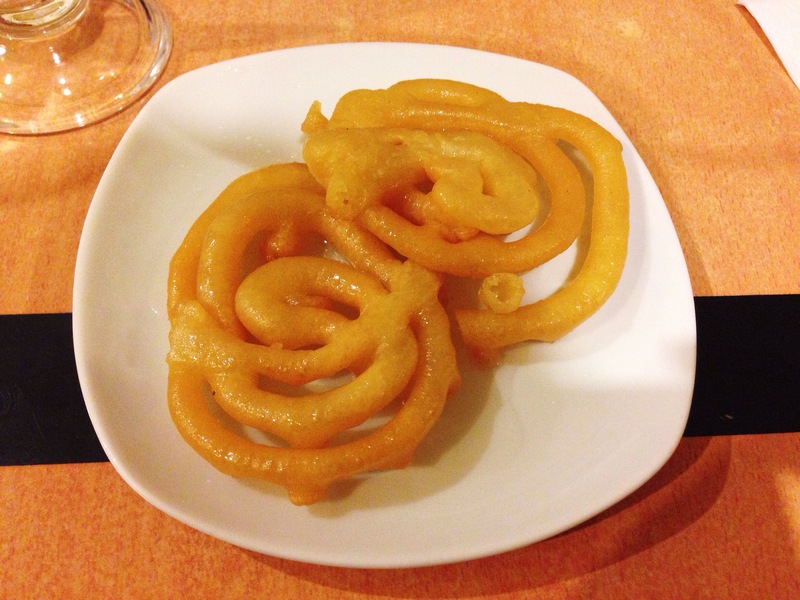 The other dessert was jeri, deep fried batter in sugar syrup. I was hoping for something reminiscent of doughnuts or churros (or even fritters), but instead it was just a maze of crispy tubes, the texture almost stale. Again, at two pounds it wasn’t by any means an expensive mistake, but it still felt like a mistake. Dinner for three came to fifty-seven pounds, not including service, for three courses, a couple of soft drinks, a couple of glasses of wine, a mango lassi and a couple of cups of chai. So inexpensive, and yet I still can’t bring myself to wholeheartedly recommend Sapana Home. It’s a pity, because the service is really good, and they deserve loads of credit for making a go of it in such a central location, but too much of it just wasn’t to my taste. So yes, maybe I did order badly – it’s quite possible, because the menu is full of less conventional options I didn’t quite have the courage to try (chicken gizzard and lamb’s intestines, for instance). Or perhaps Nepalese food is generally bland; I’ve not had it enough to be able to say. Either way, I’m sorry that I can only partly endorse the tip I received on Twitter. I’d definitely go for the momos again at lunchtime, when I fancied something different (they really are very good, and worth a visit in their own right) but then I’d probably settle up and quit while I was ahead. In May 2018, Mark and Sandra Duggan announced that they were not renewing their tenancy at the Three Tuns after seven years running the pub. Some of the existing staff have already moved on and the new landlords may well change the food offering. As a result I’ve taken it off my lists, although I’ve kept the review up for posterity. If you’ve been reading for a while you might have gathered that I’m a big fan of Reading. I think it has a lot to offer – although sometimes it only rewards those who make an effort – and I get quite annoyed at people who slate it. As a town is it what you make it. What it is missing, though, is a town centre pub that does really good food. We have great pubs. What’s not to like about finding an empty booth in the back of the Hobgoblin (yes, I know it’s not called that any more but does anyone call it by its new name?) on Friday for a quick after work pint or getting a table outside at the Allied when the sun is shining and someone has apparently picked out all the prog rock tracks over 6 minutes long on the juke box (and there are a lot – the jukebox at the Allied seems to think music stopped somewhere in the mid 80s, with a few eccentric exceptions). We have some great restaurants. But what we don’t have is that combination of the two – somewhere to get a decent pint and a decent meal, preferably at a reasonable price. Possibly the closest, although it was still far from perfect, was the Lyndhurst Arms, but then that went and closed, which means I’ll never get to review their amazing stuffed pork belly (if you’ve ever tried it you’ll know I speak the truth) let alone go there after work again for a quick drink and end up staying for dinner. This leads me, eventually, onto this week’s review. Yes, it’s a pub with a reputation for good food but no, it’s not in Reading. Previous trips out to Henley have proven that this kind of pub is a beast usually only spotted in the countryside, preferring the fresh air and customers who are prepared to drive (or are lucky enough to live nearby) instead of folk who would rather take public transport and have a drink. The Three Tuns is a different animal altogether, though: it’s in Henley centre, right on the market square (a big tick for that) and you can get there from Reading on the train in about half an hour (a second, smaller, tick). Of course, from past experience that’s no guarantee that it’s any good, but I turned up full of optimism. As a venue you could easily miss it. It’s a sliver of a building tucked between Machin’s the butcher and an anonymous clothes shop. Inside it’s broken up into a number of rooms, all wooden floored and low beamed. Our table was in the middle room where most of the diners end up, in a space seating about sixteen people. The menu here is healthily short. Five or six starters, mains and desserts with most mains under fifteen pounds and if you fancy it there’s a “pub favourites” menu which offers two courses for sixteen quid. We started with a basket of bread. This came with a generous ramekin of gloriously rich sticky caponata (like Italian Branston and one of the nicest ways to eat aubergine, though that might not be saying much) and two discs of – admittedly rock hard – dill and lemon butter. Both were delicious, though it wasn’t long before our starters arrived so we didn’t quite get the chance to savour the bread. I’d specifically told the waitress we were in no hurry for anything, so this should have rung warning bells. 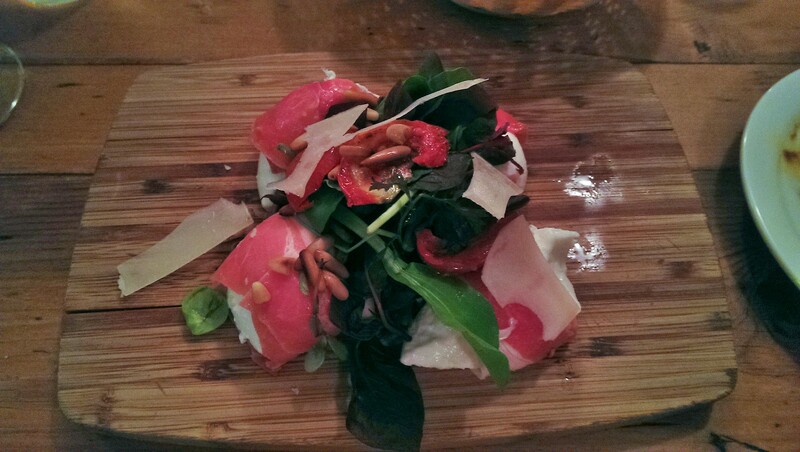 The buffalo mozzarella wrapped in prosciutto was perfect. It was deceptively large – a whole ball of mozzarella – served with a proper dressed salad with sun dried tomatoes, pine nuts and shavings of parmesan – just in case a whole mozzarella wasn’t cheese enough (like Tony Blackburn I can’t turn down extra cheese). The prosciutto was generous enough to really taste but had been stripped of most of those fatty bits on the edge that can double as unwelcome dental floss. Served on a little wooden board, as is the fashion these days, it was a bit tricky to eat but I managed, even rescuing a few scraps which fell quite literally overboard. Ten second rule and all that. The salt cod croquettes, from the pub side of the menu, were just as good. Three plump croquettes, crispy yet soft inside, came with a little dish of beautifully yellow aioli. If anything I’d say the aioli looked more striking than it tasted, but it was still just what you wanted to dip a nice big forkful of croquette into. I know that croquettes, like fishcakes, can be a way for some kitchens to make lots of money flogging you what’s essentially mashed potato, but when it’s this good you just don’t mind – and, of course, salt cod is one of those ingredients where a little goes a long way. Clever stuff, and a bit of a culinary win-win. The mains kept that standard up. 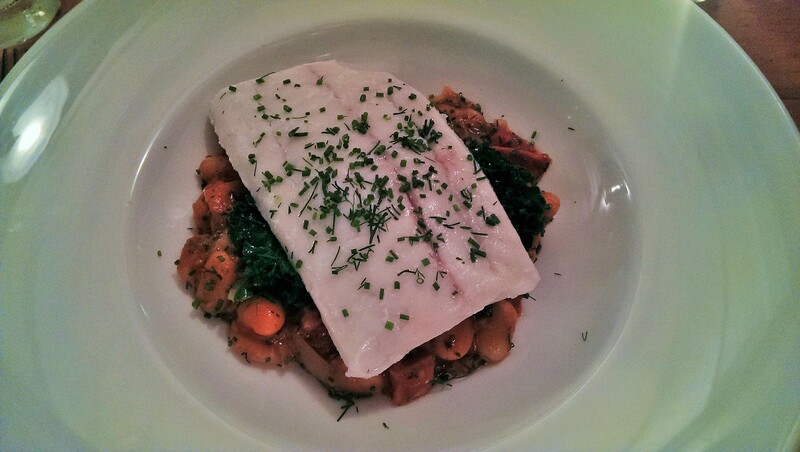 Poached brill on a chorizo and butterbean cassoulet, from the specials menu, was a hit. My favourite part was the cassoulet itself, rich and tomatoey with a bountiful amount of chorizo giving the dish the salty, smoky taste that it needed. I could happily have eaten this without the fish – plain, poached fish is a bit like Orlando Bloom, lovely to look at but ultimately not very interesting (I guess I just like crispy skin and when it’s not there I feel a little short-changed). That said, it was generous to a fault – which definitely sets the Three Tuns apart from many restaurants who confuse “healthy” with “diet option”. It was perfectly cooked, but the seasoning was a tad strange – it was topped with dill, which might have gone with the fish but was jarring with the cassoulet. 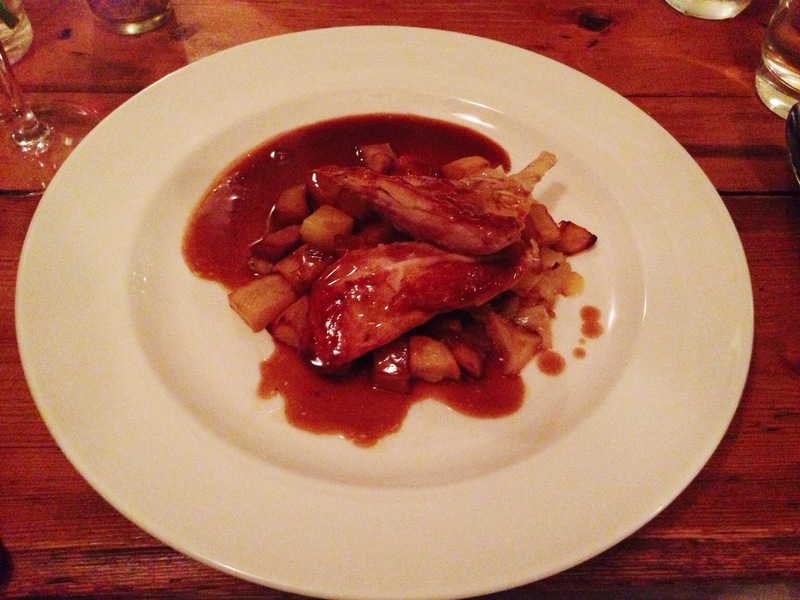 The other dish was guinea fowl breast (“pan roasted”, apparently, which is a new one on me – I thought you pan fried and oven roasted things, but there you go) with potato hash, madeira jus and some of the nicest peas in the world. They came in a little casserole dish of their own, still with some bite, with big hunks of bacon, meat from the guinea fowl’s leg – a bit like confit duck – and braised lettuce which also still had some crispness. I could just eat a bowl of those peas now, I can tell you. Again, the supporting act was more interesting than the main event, but I didn’t mind: the guinea fowl was tasty enough (I have a soft spot for a chicken supreme, as it happens) but everything it came with turned it into a really satisfying dish. It even had me hankering for autumn, despite being on their summer a la carte. The wine list at the Three Tuns is compact, too – a dozen or so whites and the same number of reds with half of those available by the glass. We picked a bottle of durif (an Australian number – also known as petit syrah, if the menu is to be believed) which was phenomenal. Rich, fruity and a bit smoky, it was dangerously easy to polish off a bottle between two. It went brilliantly with the guinea fowl and just about didn’t clash with the cassoulet, thanks to that chorizo. Pretty impressive for just under thirty pounds, too. Service throughout was excellent. The staff manage that clever service trick of being really good at what they do and on top of everything while also making it look easy and casual. When asked about the dishes our waitress knew the menu inside out, and we also got the “oh yes, good choice” that everyone wants to hear when picking what to eat. I like to feel that the staff have a vested interest in what their customers order and it definitely felt the case here. The kitchen, sadly, was not quite so perfect. Whilst the food was excellent it came out too quickly: not quite so fast that you wanted to make a scene, but quick enough to disappoint slightly because I’d turned up wanting to make a leisurely evening of it. I’m always surprised by how many good restaurants get this wrong, and it’s not as if they seemed to want to turn our table. You’d think waiting staff would realise something has gone wrong with the timing when they’re asking what dessert you want and you still have half a bottle of red wine left to drink. So we did what anyone in that position should do, and kept them waiting: red wine with fish might be a little dubious but red wine with dessert definitely isn’t on my to do list. But, of course, we did have desserts because everything up to that point had tasted so good and they were worth the wait. 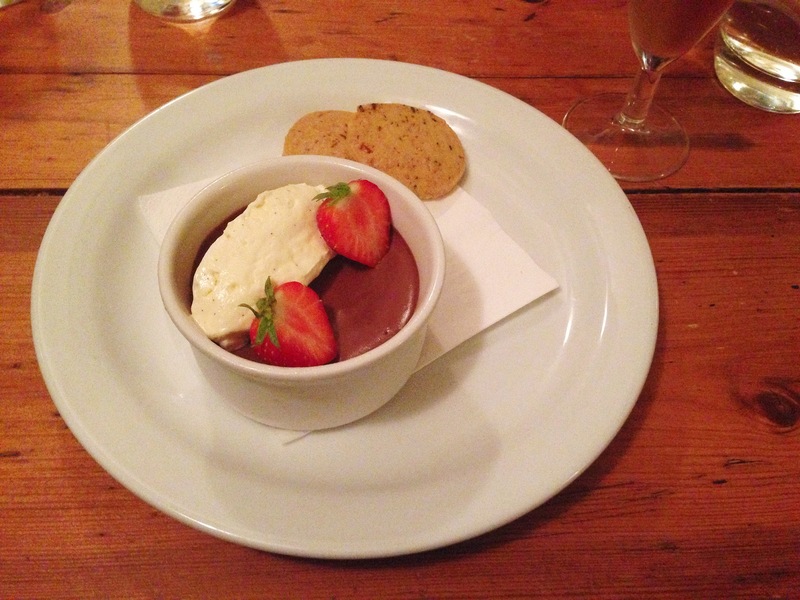 The pot au chocolat was knockout – again, a generous portion of quite a dark, firm mousse, rich with orange zest, cardamom and just a little hint of chilli lurking under all that. Deceptively complicated and yet so simple-looking, it was one of the nicest desserts I’ve had all year. The (I think) rosemary shortbread on the side added nothing, but only because the flavours in the pot au chocolat were pretty much unimprovable. Even a glass of dessert wine couldn’t do it. I also wanted to try the cheeseboard because it’s not something I order often enough in restaurants (partly because there’s so much to remember! Five different cheeses? Pasteurised and unpasteurised? Cow and goat? Will they notice if I make some notes on my phone?) The Three Tuns cleverly takes the less is more approach: just three top notch British cheeses, which makes it awfully hard to resist. Barkham Blue is a local classic (possibly the best blue cheese in the world), Lincolnshire Poacher (not so local) is a really cracking hard cheese and Stinking Bishop is famous for its whiff. On this occasion the Bishop was more like “been working on London and the Tube was a bit sweaty” than properly stinking and, if I’m honest, all the better for it. A bit younger and richer – and firmer – rather than beating you over the head with all that gooey stench. If I had criticisms (and sadly, I did) they were too cold to properly release all that flavour and the biscuits were a bit uninspired, but even so it was a generous helping and washed down with a glass of ten year old tawny it made for a great way to round things (and me) off. Bread and butter, three courses, the cracking bottle of red and a couple of snifters with dessert came to a hundred and ten pounds, not including tip, so it may be a pub, but the prices aren’t quite pub prices. But is it worth it? Absolutely. Almost flawless food, a great wine list, brilliant service and one of the cosiest, nicest rooms I’ve eaten in in a very long time. Obviously there are a few things I’d change – I’d have liked my food to come out a little slower, I’d like there to be a direct train from Reading to Henley or, better still, I’d like to pick it up and drop it somewhere in the middle of Reading. But maybe part of the magic is that I can’t. So until Reading gets a pub that can do food of this standard, somewhere that is in the middle of town but feels like it’s out in the country, I’ll be back. Tons. I’m sorry, but there’s no new review this week. The thing is, I’m off on holiday and going to restaurants in another country tends to make going to restaurants in Reading rather an impossibility. And I’m sure you wouldn’t want to read reviews of What I Ate On My Holiday (besides, it’s quite nice to eat off duty once in a while and not have to make mental notes of everything. Trust me on this.) So please accept my apologies, but this is the first break from reviewing I’ve had since last Christmas and I figured a break would do me good. That said, I didn’t want to leave you without a post this week. I wanted to put something up. I’ve already reviewed the ten best dishes of the last year, so what else could I do? Fortunately, racking my brain and re-reading the reviews from past twelve months, something occurred to me. I use a lot of similes, don’t I? I thought. This was only reinforced by reading the reviews of some of my favourite dishes: it’s true. I seem to love similes like… someone who really likes similes, like… well… similes fail me, put it that way. So why not sit back, enjoy the year in similes… ready? Of course, to use yet another simile, you might feel that reading this post is a bit like sitting down to an episode of Friends to find that you’re watching that one that pretends to be a new episode but is actually made up of loads of clips of previous episodes that you’ve already seen (you know the one I’m talking about). If so, I’m not sure I can blame you – so tune in next Friday when I’ll have a brand new review for you. Just like a restaurant reviewer.